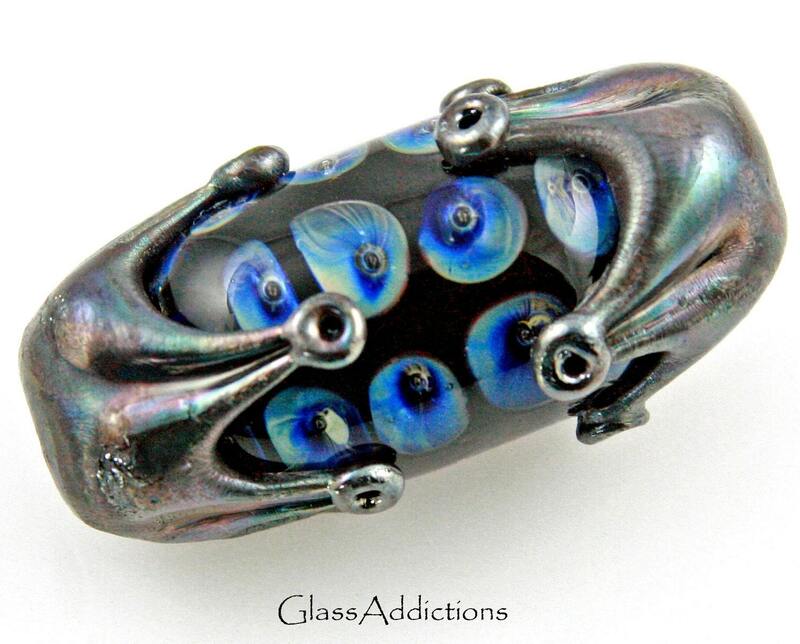 Jennifer Cameron of Glass Addictions creates beautifully intricate glass lampwork beads. Tell me about how you originally got into your craft, Jennifer. I originally started by taking a class on making a stained glass panel. We had just moved to a new city, into a much smaller home with my husband and 2 year old, and I was going stir crazy. The class was simply a means to get out of the house. However, I was immediately in love with glass, which led to more classes that I had to travel around the country to take. I initially started fusing, but 3 or 4 years after that first stained glass class, I got a torch and haven't done any kind of stained glass construction for about 5 years and even though I have several kilns, I rarely fire any of them except the bead kiln. I don't know if I could pick just one. I love to spend time with my husband and children. I would be the happiest person alive if I could play in the flame all day, but that is not possible. I also love reading to the point where I will stay up all night because I cannot put the book down. Time. There isn't enough of it. The other big challenge is doing the paperwork involved with it. I just want to pull my hair out when I am working on it. I often avoid it until it is so unmanageable that I feel like I will never dig out. I went through all kinds career choices-nurse, teacher, doctor, lawyer, journalist, veterinarian, psychologist. I tell my kids now that I want to be a rock star when I grow up. Then I sing a song I made up about wishing I had my teeth while covering my teeth with my lips so it looks like I have none. They just give me "the look"